According to the General Social Survey on Canadians’ Safety (Victimization), there were 22 incidents of sexual assault for every 1,000 Canadians aged 15 and older in 2014. This represented approximately 636,000 self-reported incidents of sexual assault. The rate of self-reported sexual assault in 2014 remained unchanged from 2004; however, declines were noted over the same time period for all other types of violent and non-violent crime measured by the General Social Survey on Victimization. 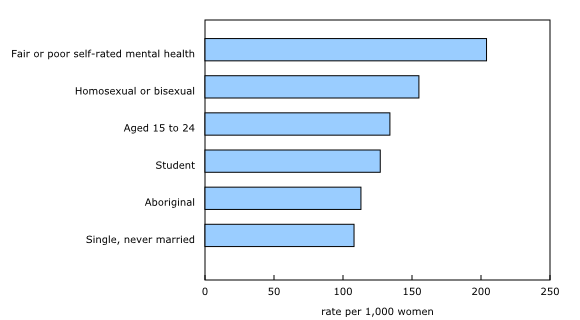 A higher risk of sexual assault was noted among those who were women, young, Aboriginal, single, and homosexual or bisexual, and those who had poorer mental health. In addition, individuals who had certain experiences—childhood abuse and homelessness—and more evening activities outside the home also had a higher risk of sexual assault. Among the three types of sexual assault measured by the General Social Survey on Victimization in 2014, seven in ten self-reported incidents were unwanted sexual touching, two in ten were sexual attacks and one in ten was sexual activity where the victim was unable to consent. Victims of sexual assault often had negative perceptions of their neighbourhood, lower levels of trust in others and less confidence in the police, compared to those who were not sexually assaulted. They were also less satisfied with their personal safety from crime and less likely to feel safe in certain situations. Overall, sexual assault offenders were most often men, acting alone and under the age of 35. Just over half of victims knew the person who sexually assaulted them. Most often, offenders were a friend, acquaintance or neighbour, then a stranger. Of all sexual assault incidents perpetrated by someone other than a spouse, one in twenty was reported to the police, compared to one in three incidents of other types of crime measured by the General Social Survey on Victimization. There were more than 635,000 incidents of sexual assault reported by Canadians in 2014. In the vast majority (87%) of these incidents, the victims were women. 1 in 10 (9%) was sexual activity where the victim was unable to consent due to, for example, drugs, intoxication or manipulation. Results show that there were approximately 22 incidents of sexual assault for every 1,000 Canadians aged 15 and older in 2014. The rate of self-reported sexual assault in 2014 was unchanged from the rate reported a decade earlier in 2004. This was a marked contrast to all other types of violent and non-violent crime measured by the GSS on Victimization over the same time period. For instance, rates of self-reported robbery and physical assault—the other violent crimes measured by the survey—declined by 39% and 35% respectively. While the rate of self-reported sexual assault was unchanged over the decade, police-reported sexual assault declined by 20% in Canada. This demonstrates that, due to a range of factors, police-reported data can underestimate the nature and extent of sexual assault. As has been the case historically, few sexual assault victims turned to the police. Specifically, 1 in 20 incidents of sexual assault was reported to the police in 2014, a pattern that was unchanged from 2004. The most common reasons for not reporting to the police were that the victim perceived the crime as minor and not worth taking the time to report (71%), that the incident was a private or personal matter and handled informally (67%), and that no one was harmed during the incident (63%). In addition, more than 4 in 10 (45%) sexual assault victims stated they did not report the incident to the police because they did not want the hassle of dealing with the police. Similar proportions did not turn to the police because the victims thought the police would not have considered the incident important enough (43%), because of a lack of evidence (43%) and because they believed the offender would not have been adequately punished (40%). Rates of self-reported sexual assault varied. Overall, men were far less likely to be sexually assaulted than women. Among women, the rate of sexual assault was highest for those who rated their mental health as ‘fair or poor’ (204 per 1,000 population) and those who self-identified as homosexual or bisexual (155), followed by young women aged 15 to 24 (134), and women who were students (127), Aboriginal (113) and single (108). These rates were all significantly higher than the overall rates for women (37) and for men (5). Childhood abuse—that is, physical abuse or sexual abuse experienced before the age of 15 perpetrated by an adult aged 18 or older—has been identified as a serious social issue that has the potential to affect victims into adulthood. Canadians who experienced either type of childhood abuse reported a rate of sexual assault that was over two times higher than those who had not been abused (36 versus 15 per 1,000 population). This difference was more pronounced among those who had experienced childhood sexual abuse, as those individuals had a rate that was about four times higher than those who had not been sexually abused (70 versus 17). A difference was also noted between women and men: among those who had experienced either type of childhood abuse, the rate of sexual assault was over six times higher among women than men (65 versus 10). Victims of sexual assault experience a range of negative impacts. Most commonly, victims reported feeling angry (35%), or upset, confused or frustrated (21%) after the sexual assault incident. One in four (25%) victims reported that they had difficulty carrying out everyday activities as a result of their victimization. About one in six (15%) victims of sexual assault reported experiencing three or more longer-term emotional consequences, indicating the possibility of post-traumatic stress disorder. Victims of sexual assault were, in general, less satisfied with their personal safety from crime. They were also less likely to feel safe in certain situations—when using public transportation alone after dark, when walking alone after dark and when home alone after dark—compared with those who were not sexually assaulted and those who were victims of physical assault. Sexual assault victims were also less likely to report that they lived in a welcoming community. They were more likely to report that they thought crime in their neighbourhood was higher than in other areas in Canada and that they believed crime had increased in their neighbourhood over the past five years. Victims of sexual assault had lower levels of trust in neighbours and strangers, and less confidence in the police. Nearly all (96%) incidents of self-reported sexual assault were perpetrated by someone other than a current or former spouse. Offenders in these incidents were most often identified as men (94%), acting alone (79%) and under the age of 35 (68%). In addition, sexual assault offenders were more commonly a friend, acquaintance or neighbour (52%) than a stranger (44%). This article is based on the 2014 cycle of the General Social Survey (GSS) on Canadians’ Safety (Victimization). 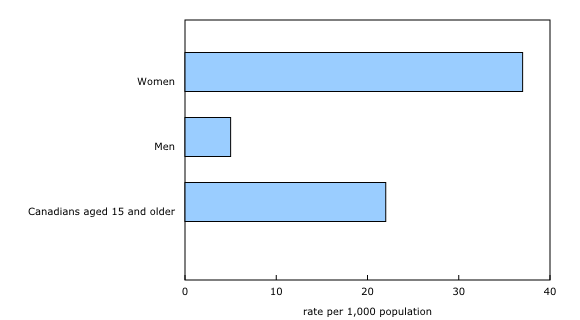 The target population was Canadians aged 15 and older living in the provinces, excluding those living full-time in institutions. In 2014, the survey was also conducted in the three territories using a different sampling design. In 2014, the total sample size for the provinces and territories was 35,167 respondents. The 2004 GSS on Victimization collected information from respondents in the provinces only, while the 2014 GSS on Victimization collected information from respondents in the provinces and territories. For comparisons over time, 2014 data from Yukon, the Northwest Territories and Nunavut are excluded where 2004 data are discussed. In 2014, nearly all (96%) incidents of self-reported sexual assault were perpetrated by someone other than a current or former spouse. Spousal violence includes incidents perpetrated by a current or former spouse or common-law partner. Information about non-spousal violence is collected by incident, whereas information about spousal violence is collected as a grouping of incidents by victim and may include incidents of non-sexual violence. Spousal violence often involves repeated victimization and it would therefore be too burdensome to ask victims to recall each incident they experienced. It is not possible to provide detail about a specific incident of spousal violence. For this reason, the characteristics of sexual assault offenders and incidents, the emotional and physical consequences of sexual assault, and reporting sexual assault incidents in the context of spousal violence are excluded from this article. Information specific to spousal violence, based on the 2014 GSS on Victimization, can be found in Section 1 “Trends in self-reported spousal violence in Canada, 2014” of the publication Family violence in Canada: A statistical profile, 2014.